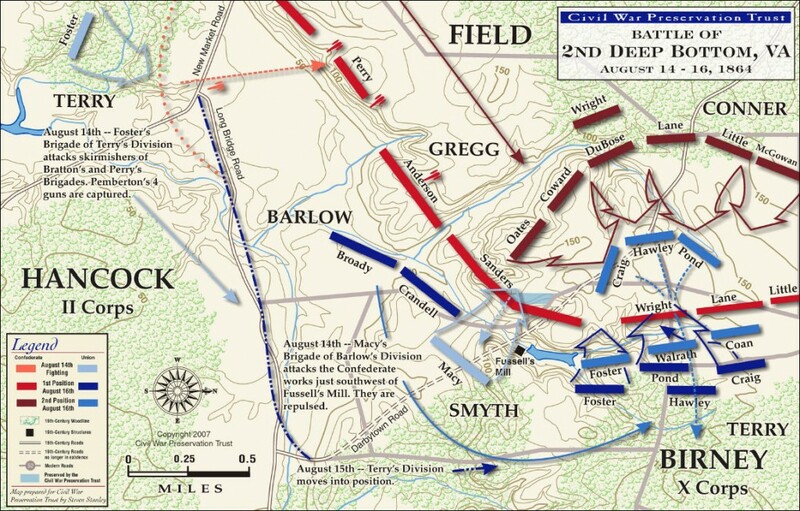 Brief Summary: The initial fighting on August 14 along New Market Heights (X Corps vs. Field) and southwest of Fussell’s Mill (II Corps vs. Gary’s Cavalry Brigade and Anderson’s GA Brigade) resulted in a Union halt far earlier than Federal commander Winfield Scott Hancock had planned. In an effort to make some headway and spring the Union cavalry free, Hancock was instructed by General Grant to shift the X Corps from west of Four Mile Creek and facing north against New Market Heights, over to the right of II Corps east of Bailey’s Creek. Once in position, the X Corps would attack the Confederate lines just north of Fussell’s Mill and attempt to turn their left flank. This movement took most of the day on August 15, longer than Hancock had planned for. The delays were attributable to the extreme heat and the decision by Tenth Corps commander David Birney to have his brother William Birney’s trailing division pass by Terry’s leading division at Strawberry Plains and then lead the march to Fussell’s Mill. By the time David Birney’s Tenth Corps reached his assigned jump off point, he had lost a third of his men to the heat. To make matters worse, a Rooney Lee’s cavalry division had reached the Confederae left flank on Charles City Road from Petersburg, where it drove back Gregg’s cavalry protecting the Union right. William Birney detached an infantry brigade from his division to neutralize this threat to the rear. He also sent a white brigade and a black regiment to turn the Confederate infantry’s left north of Fussell’s Mill. These Union troops not only didn’t attack, but fired into each other mistakenly. These and other concerns meant the attack planned for August 15 would have to wait until August 16.